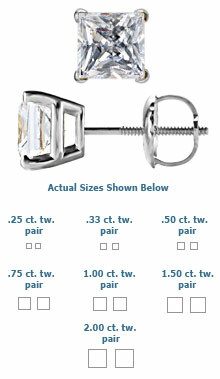 This is a beautiful pair of 14k white gold princess diamond stud earrings. Each .38 carat diamond in the pair has a color of G-H and a clarity of SI. These earrings have security screw posts for pierced ears. Total carat weight of pair is .75 carat.